Make the most of your outdoor space with our Chichester benches. Featuring a backless design, these garden benches are a perfect, space saving option that does not compromise on comfort. With their simple yet contemporary design, these garden benches will modernise and compliment existing furniture. 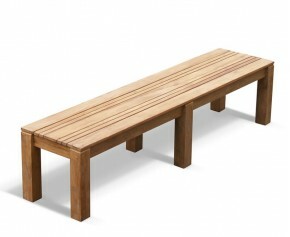 Also stunning as a focal point, these Chichester benches are wonderfully versatile. Made from the finest grade-A teak, these Chichester benches are weather and insect proof and can remain outdoors all year round with minimal maintenance required. Equally ideal for deployment in public space, these garden benches are a smart, efficient and stylish option.